When the time has come for you to install new replacement windows in your Brampton home, there are a lot of things to consider. One of the most important decisions you can make in the process is which contractor to choose. 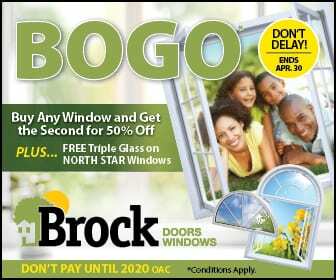 Brock Doors and Windows has been serving Brampton homeowners with quality installations for almost three decades. We are committed not only to quality, but to helping you ensure that your Brampton home is equipped with superior performance. Here at Brock Doors and Windows, we aim to supply our customers with the fastest turnaround times, as well as the utmost care and customer service. We promise that not only will you be satisfied by the job that we do, but that it will far exceed your expectations. Let’s start with our products. When you choose energy efficient replacement windows in Brampton from Brock Doors and Windows, your view will change for the better. We incorporate all the latest glazing technologies on our windows. This energy efficient window glass enables our windows to block the extreme solar heat, while allowing natural light to enter your home. With our windows, you’ll be able to enjoy an unobstructed view through your windows, that integrates natural light, and protection from harmful solar rays. Blocking these UV rays is imperative, because they can cause uncomfortable temperatures in your home, as well as damage to your furniture and interior furnishings. We chose to supply you with vinyl windows, because not only is vinyl highly affordable, but it comes with a laundry list of other benefits. Did you know that vinyl replacement windows from Brock Doors and Windows can actually help you save on your energy bills? This is because vinyl is highly energy efficient, and windows made from this fantastic material will maintain comfortable temperatures in your home. Our vinyl windows are specifically designed to hold the warm air in and keep the cold air out. Our vinyl windows have multiple glazings available, including Low-E coatings. Brock’s energy efficient vinyl windows will reduce your energy costs by eliminating the need for your heating and cooling system to work overtime during the winter and summer seasons. In climates like Brampton, which mainly require cooling, your savings will range from 7-31 %. In addition to saving you money on your utility bills, Brock’s windows will increase your light and views. Tinting can reduce the amount of light that enters your windows, and also obstruct the view, but the good news about our windows is that they don’t need tinting in order to perform well. There is no faster or better way to brighten your home than to install brand new replacement windows from Brock Doors and Windows. Call us today for your free consultation!